The two collections are widely divergent. 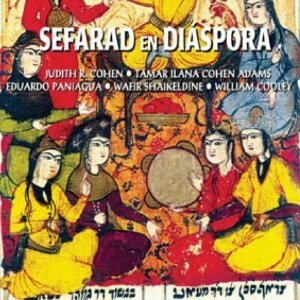 Sefarad en Diáspora (“Sepharad in Diaspora”) includes—somewhat incongruously—a panoply of musical traditions besides Judeo-Spanish, from the Yiddish (a song transmitted in part by Cohen’s Ashkenazi aunt), to the French Canadian and the Anglo-American. The 28 songs are grouped thematically and Cohen’s intention is to highlight the universality or interconnectedness of various folk traditions as they have transmuted and traveled over time since the Middle Ages. 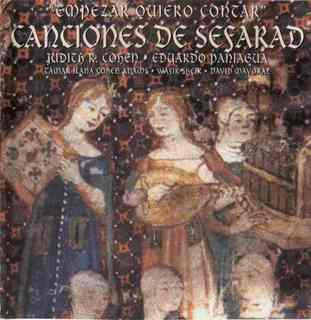 ‘Empezar Quiero Contar’: Canciones de Sefarad (translated as Songs of Sepharad: ‘I’d Like to Begin the Story’) is, for this reviewer, the more intellectually compelling of the two CD collections. Like Sepharad in Diaspora, ‘I’d Like to Begin the Story’ encompasses a geographically broad array of Judeo-Spanish musical traditions, from Hebrew poems of medieval Spain, to Portuguese melodies preserved in Portugal’s crypto-Jewish community and Haketía romances exported from mid-twentieth century Morocco (19 songs in all). Two songs in ‘I’d Like to Begin the Story’ highlight the usability of Cohen’s recordings for the historian’s classroom. As Cohen has pointed out in her printed scholarship  and in her carefully worded CD insert, no one knows how most medieval Hebrew poetry or Iberian romances sounded. “Hayizkor ya’alat hahen yedid?” (“Will He Remember the Graceful Doe?”) is the only medieval Hebrew poem attributed to a woman—the anonymous wife of Dunash ibn Labrat (10th century Spain). Beyond reminding us that medieval Hebrew poetry was not just read, but also sung (the Hebrew word for ‘poem’ is in fact synonymous with ‘song’), Cohen’s musical rendition shows how informed imagination can resurrect these texts into an oral-aural form. The melody Cohen selected for Labrat’s poem is based on the notations of a 12th century female troubadour of Provence. This chronological and geographical anachronism, which Cohen acknowledges and applies “with misgivings,” serves to “bring the work of a medieval Jewish and a medieval Christian woman to life.” In fact, this is the first time, to Cohen’s knowledge, that ‘Marat’ ibn Labrat’s poem has ever been musically recorded . Using instruments designed according to medieval specifications—such as the adufe or pandeiro quadrado (square frame drum)—and sometimes borrowing musical notations from medieval traditions elsewhere in Europe, Cohen has undertaken an interpretive reconstruction that possibly approximates the cadences of so-called Golden Age poetry. Perhaps only the finely-tuned ear will pick up various enunciation inaccuracies in the Hebrew poem “Will He Remember the Graceful Doe?,” where Cohen pronounces the Hebrew letter ayin like an aleph instead of gutturally, where the word for “she took” is incorrectly rendered as “he took” (“lakah” instead of “lak-kha”), where the word for “did she not” (ha-lo) is bungled as the nonsensical “kha-lo,” and where the word “ha-yisha’er” is botched as the non-existent “ha-yishae’et.” Full awareness that the songs of Sepharad were composed and sung in an Arabic environment is lacking in the case of the first mistake, while the other errors originate in the faulty Hebrew transcription of the original manuscript and Cohen’s flawed transcription of the Hebrew into Latin letters. Similar problems effect “Who stood on Mount Horeb?” Cohen strives for musical historicity in her use of the medieval square frame drum and in her wariness of ascribing anachronistic melodies to medieval Hebrew poems —why should accurate Hebrew pronunciation be any less important? In addition, the historian will be hard pressed to explain the inclusion of Obadiah the Proselyte, a Norman convert from Christianity living in early twelfth-century Italy, as the author or transmitter of a “Song of Sefarad.” The Iberian Jewish diaspora, after all, did not begin until 1391. Also unclear is the presence of “I Shall Make My Song for Another” (“Por autrui movrai mon chant”), by the 12th century French troubadour Matthew the Jew (“Mathieu le Juif”). These songs’ inclusion causes one to repeat the question raised for the selections assembled in Sefarad en Diáspora: what exactly coheres the works in this collection? Ultimately, more for classroom value than for linguistic or historical inaccuracies, Cohen and her artistic collaborators have shown their academic audience that we should not only strain our eyes, but also perk up our ears. Performers native to Ottoman Sephardic civilization—from Victoria Hazan (b. Izmir, 1896) and Jack Mayesh (b. Kuşadası, 1899), to Flory Jagoda (b. Sarajevo, 1925) and Yehoram Gaon (b. Palestine, 1939)—will always have unmatched appeal for presenting or modifying what they grew up hearing rather than what they learned as professionals. “Non-native” folklorists who have recorded Judeo-Spanish musical traditions abound, most of them with dissonant pronunciation, and debates over what constitutes folkloric “authenticity” will not soon wane. But few of these performers are academically trained ethnomusicologists who combine original fieldwork, artistic talent, and critical analysis. Judith Cohen is among these and as such her oeuvre from the century’s first decade offers an intellectual-performative dimension that can embellish college and university-level classes in an academically responsible way. Judith R. Cohen, “Judeo-Spanish (‘Ladino’) Recordings,” The Journal of American Folklore 112: 446 (Autumn, 1999), pp. 530-540; 531-32; insert, “‘Empezar Quiero Contar,’” p.8. Liner notes, ‘Empezar Quiero Contar,’ p.16. Norman Golb, The Autograph Memoirs of Obadiah the Proselyte of Oppido Lucano, March 2004, viii, http://oi.uchicago.edu/pdf/autograph_memoirs_obadiah.pdf. Ibid., “The Music of Obadiah the Proselyte and his Conversion,” Journal of Jewish Studies 18: 1-4 (1967): 43-63.